Yoshihiro cutlery quite rightly boast that they manufacturer the ultimate Japanese kitchen knives. 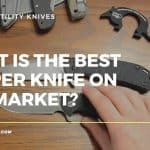 The company has a fantastic reputation and is very much in a league of their own when it comes to the high quality handcrafted Japanese kitchen knives that they produce. In fact they are often cited as producing some of the best kitchen knives in the world. The guys over at Yoshihiro simply know how to make knives of the highest quality. The company has been manufacturing knives for over a century in Japan; and the skills their craftsmen use to create these tools actually date back much further than that. 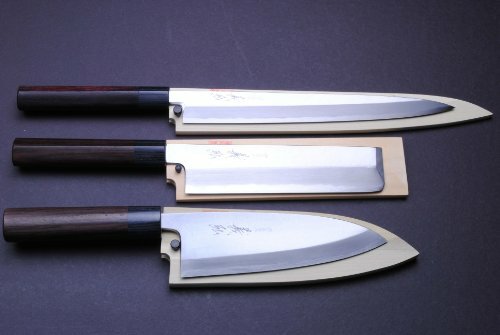 The origins of the techniques used to make Yoshihiro knives began in the 14th century. It was then that early medieval Japanese sword smiths perfected the techniques of handling fire, iron, and water to create the weapons of the samurai. As the history of Japanese knife forging tells us, over a period of centuries, the sword smiths gradually transitioned to knife smiths. With that transition came an ethos of knife making that sets the region apart when it comes to quality and precision. All of this comes at a price however. As one of the best Japanese knife brands around, Yoshihiro knives are not cheap. This is where our guide hopes to assist. When you are paying top dollar for what will arguably be something you hope to use for years; you need to ensure that you are purchasing the correct tool for you. So lets start by taking a look at some of the most highly regarded Yoshihiro Sashimi Sushi knives currently available. Versatility is the name of the game when you’re dealing with a Japanese slicing knife (Sujihiki knife) such as the Yoshihiro Hammered Damascus 9.5inch. Purchase one of these and it will quickly become your go to tool in the kitchen. Slicing fish, no problem, carving a roast chicken straight from the oven, reach for the Yoshihiro. It will do the job with ease and the elegance you would expect from a handcrafted tool of this calibre. However, that’s quite enough of the hyperbole. What exactly are you getting for your money on this one? Well the knife itself is forged and hammered with 46 layers of steel in the Damascus tradition. The knife also has a Nickel VG-10 Gold Core which ensures a strength and durability beyond anything you could ever hope to receive from a production-line. This is the kind of tool you will be handing down to your favourite grandchild who likes to do a bit more than ‘dabble’ in the kitchen. The level of craftsmanship extends to the handle of course, which is made from traditional Japanese style handcrafted Shitan Rosewood. As mentioned earlier, versatility is the go here. 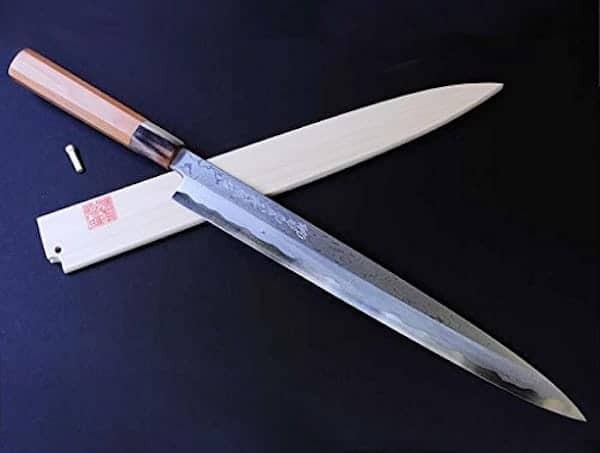 The Yoshihiro Hammered Damascus Sujihiki slicing knife has actually been designed with both the traditional Japanese and Western style slicing knives in mind. The long 9.5 inch straight blade smoothly slices through meat or vegetables while preserving the freshness of each ingredient. Furthermore the hammered texture of the blade means friction is eliminated and food slices will not stick to the knife. 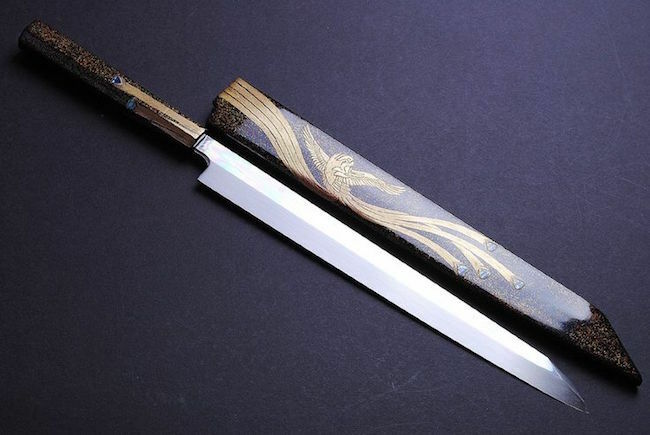 Yoshihiro also provide a protective wooden sheath called a Saya. This helps protect the knife while not in use, (at the same time as increasing the aesthetic quality of the instrument). 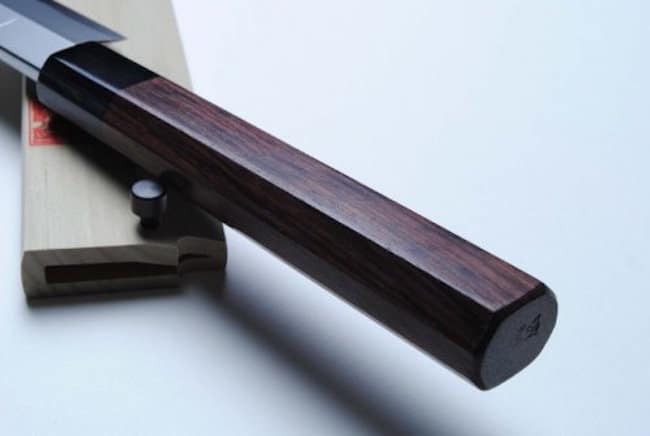 The Yoshihiro Hammered Damascus Sujihiki 9.5 inch is a knife that you can use everyday. 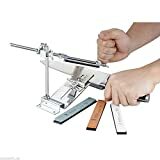 Its versatility lends itself to all the main jobs in the kitchen; furthermore when using a tool of this quality, even the most mundane tasks will become a pleasure. If this is your first foray into purchasing a premium priced Japanese slicing knife, this is the one to go for. 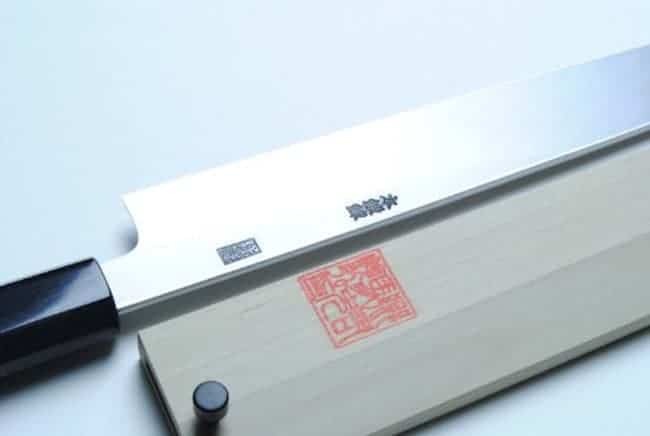 The Yoshihiro Hongasumi Yanagi Sushi Sashimi Chef’s Knife is designed specifically for slicing fish. The 10.5 inch (270mm) single edged blade with a traditional grind is Completely flat ground on the front (SHINOGI), with a concave ground (URASUKI) and with flat rim (URAOSHI) on the back. This shape means that the blade is perfect for the long deep slicing required for preparing sushi. The knife will glide through such ingredients with no pressure required. You only need start the cut and pull the knife back through the meat for effortless slicing. Again, all the signature qualities of a handcrafted Yoshihiro Sashimi knife are present. The instrument is forged from High Carbon Blue Steel. This provides high performance edge retention, while at the same time allowing for the blade to take on a finer edge. In practice this means it is possible to make this knife ludicrously sharp. 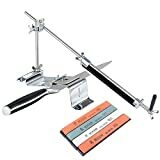 If you know what you are doing with a whetstone sharpener, this tool will be by far the sharpest knife in your collection. With this in mind, it should be noted that this particular 10.5 inch Yoshihiro is better suited to intermediate and higher level chefs. Not only do you need to know how to use it properly and safely, there is a little upkeep to be had with a knife of this nature. The fact is, like many traditional Japanese carbon steel knives this is not a stainless product. They do require proper care. A magnolia wood knife sheath is supplied, alongside knife oil, and a rust eraser. You should only hand wash this knife and keep it sharp by using quality whetstones. But that ‘s the performance and maintenance issues covered; we shouldn’t forget how good this knife looks. The simple and elegant design is complimented with a handcrafted Rosewood Japanese Octagonal shaped handle and a shitan bolster. What you end up with is a beautiful lightweight and well-balanced instrument that is simply a pleasure to use. 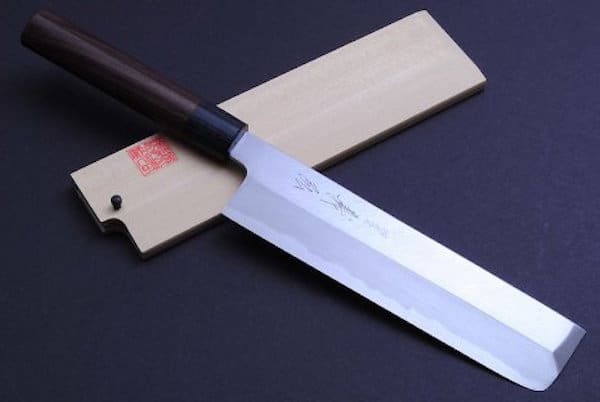 The Yanagi is one of the most essential of traditional Japanese knives and is a powerful component in the repertoire of many chefs. The elegant thin blade has the ability to slice through ingredients in long uninterrupted strokes; essential for preserving their integrity and freshness. 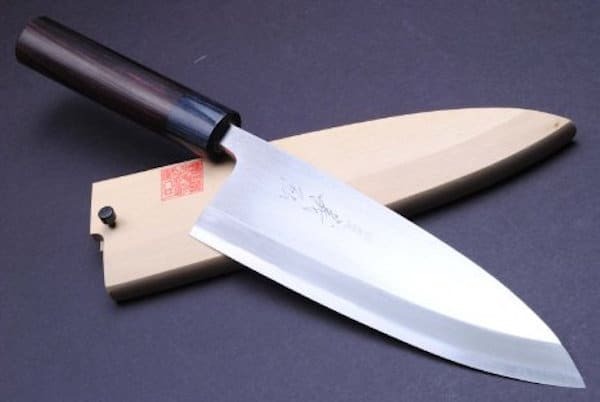 The knife is 100% handcrafted in Japan and it is clear that the expert craftsmen at Yoshihiro are committed to attention to detail of the highest level. This is an essential tool for any sushi chef. This Yoshihiro 3pc Sashimi Sushi knife set makes our list as it represents extraordinarily good value for money. 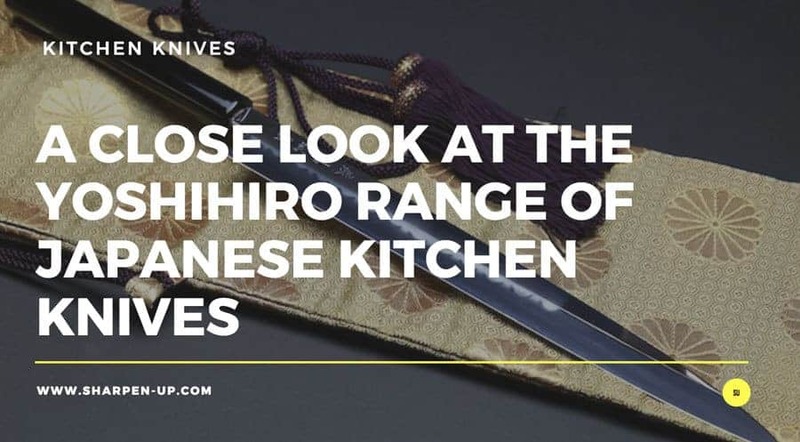 Suitable for both beginner and experienced chefs, with a purchase such as this, you are getting 3 premium handcrafted Japanese Yoshihiro knives for the price of one of the company’s mid-range offerings. 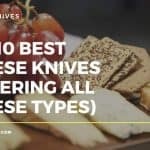 An essential series of knives I am sure you will agree. 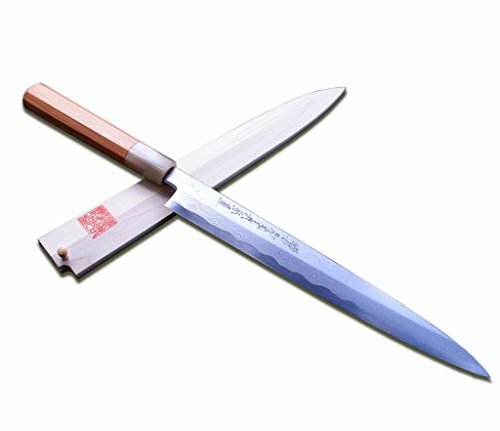 Kasumi actually means mist in Japanese and is a reference to the way the knives are forged from two materials; blue or white steel and soft iron. The resulting process gives each blade border a beautiful wave like appearance that looks like.., well mist. As you would expect, such quality craftsmanship extends to the handles; each knife utilises traditional Shitan rosewood, with bolsters made from the same. A beautiful Saya cover is included for each of the instruments. It is hard to fault this Yoshihiro Shitan Japanese 3 piece knife collection. 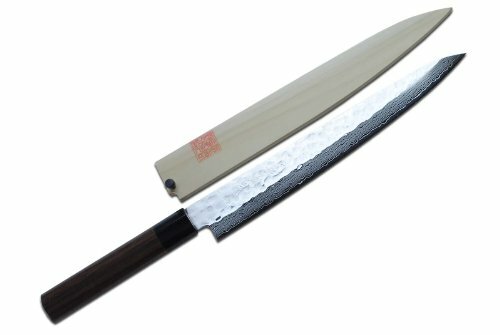 If you are looking for a series of knives that will take care of all your sushi preparing needs you need look no further. The fact you are getting 3 handcrafted premium Japanese knives for a little more than the price of one cannot be ignored. 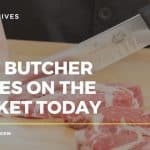 If you have the budget to go that little bit further and purchase these knives, you will not be disappointed. As a beginner chef you’ll find yourself preparing sushi every other day just for the pleasure of using your knives. 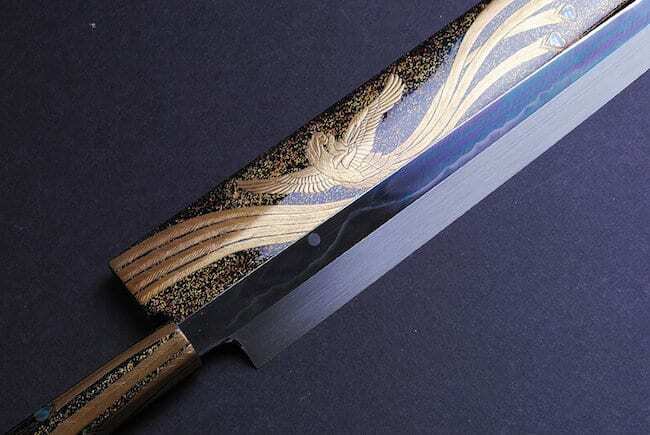 Yoshihiro like to give their knives names that relate to mystical Japanese visions. Here the word Suminagashi actually translates as the surreal image of ‘floating ink’. It refers to the beautiful marbled wave like patterns that extend through the blade from the tip to the heel. Quite magically, a new mosaic is revealed every time the knife is sharpened. You do not get that with your average kitchen knife. This particular Yoshihiro knife has a traditional Japanese handle made from the wood of the Yew Tree and affixed with a Water Buffalo horn bolster – it is quite simply stunning to look at. As with all the top Yoshihiro Sashimi knives in our list, the Suminagashi comes complete with protective wooden sheath called a Saya. This encases the knife when not in use, and is crafted in a manner to compliment the aesthetic beauty of the knife. Again, proper care must be employed when owning an instrument of this calibre. It is essential that the knife is kept dry in between usage. Tsubaki Oil (which is included) needs to be applied before storage. When it comes to sharpening and honing, owners should only use premium quality Japanese water stones. Another quality sushi knife from Yoshihiro. The Suminagashi is a little more expensive than the Hongasumi reviewed above. And while the performance of each is similar, (you will find yourself able to slice through fish with almost frightening ease), the aesthetic attention to detail on this one is on another level. 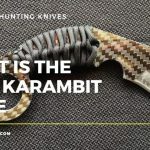 The mosaic patterns that stretch through the blade, along with that traditional Yew tree handle, mean that it is not an exaggeration to call this knife a work of art. The Suminagashi is a very special Japanese sashimi knife indeed. We have included this particular Yoshihiro knife, so you can see the level of craftsmanship that this company is able to achieve. If you are in the market for a knife like this, well done, we would like to shake your hand. First off, the guy that forged the knife is famous. Legendary master craftsman Masakuni is the man behind this one of a kind work of art, and no expense or highly skilled process was spared in its creation. 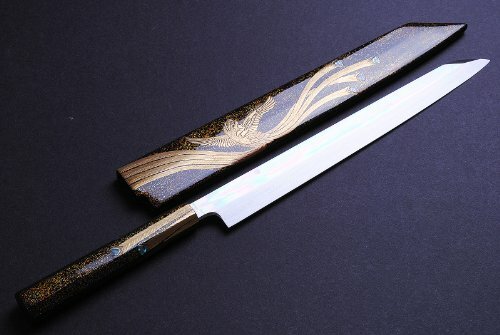 The knife was finished with the ancient techniques of Japanese sword polishing. Yoshihiro Aoko Blue Steel #1 was used and a Mizu Yaki Water Quenched Honyaki Mirror-Finished Yanagi Kiritsuke materials and process employed. In short, this is the highest level of quality in Japanese knife crafting. Mizu Honyaki is a process that requires the steel to be quenched with pure water in order to draw out the hardness of the material. 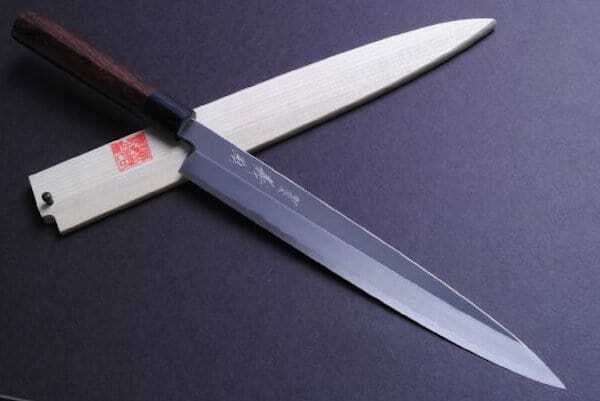 Honyaki means “true forged” and is said to be the purest form of traditional Japanese sword making. A single piece of Blue Steel #1(HRC 66), is heated in hearths that reach temperatures in the thousands, (with the process of Mizu Honyaki being employed throughout). The meticulous polishing gives the knife a brilliant mirror finish, and it is here that the art form of is taken even further. 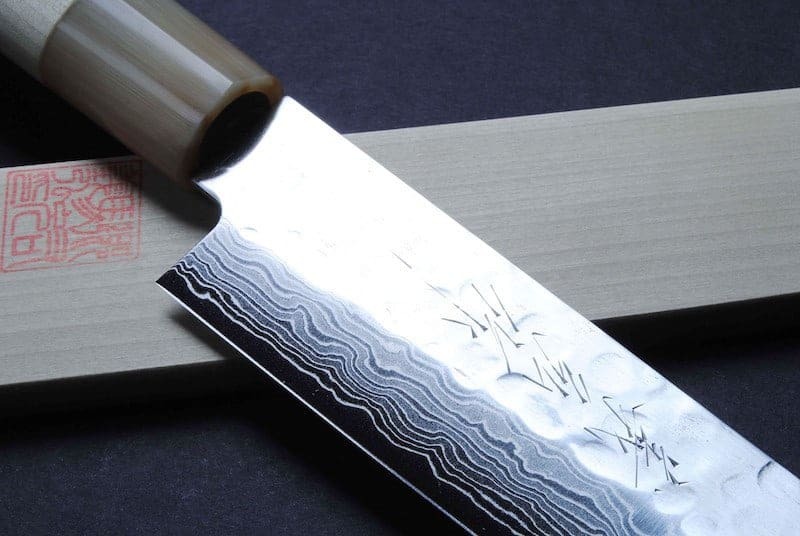 Across the surface of the blade’s temper line “Hamon” are inlaid images of Mt. Fuji under a Full Moon, (a rare feat that only a master sword maker can hope to achieve). The blade is complimented in its beauty with an octagonal Magnolia Fuki Urushi Japanese Hand Lacquered Handle. And of course, the protective sheath has to live up to the standards of the knife itself. A rare artisan crafted “Saya” is included – a wooden sheath handcrafted with Fuki Urushi Japanese Lacquered Phoenix decorated Magnolia wood. If you would like to own one of the best kitchen knives in the world, you may well have found it. Japanese kitchen knives do not come much better than this.